Dani Greene is a fourth-generation maple syrup maker. She is 27, the unmarried baby of the family, and lives with them in Sugar Grove, New Hampshire. There is an annual pre-Thanksgiving pancake-eating contest (a big draw), which her grandfather, Emerald, always wins. However, this year there is something new added: an outsider, Alanza Speedwell, joins the contest, and when it is down to just Grandpa and her, she drops dead while still eating. Dani's ex-boyfriend, Mitch Reynolds, is a police officer, and he suspects her or one of her family of doing the woman in. Dani knows she needs to find the real killer before someone in her family winds up in jail. Okay, I really wanted to like this book for two reasons: Jessie Crockett and the fact that it takes place at Thanksgiving (because I love reading the season, as it were). Unfortunately, I don't think it's very good. In fact, I struggled to keep up with the story. Which isn't to say that it's not a good story line; it is one that is tried and true: Someone dies, the hero/heroine (or family member) is accused of the crime, and they have to find out who the real killer is. It's just that I found it boring. We meet Dani when she is sneaking outside to get away from her family, claiming a migraine. She heads out to the sugarhouse to have a glass of wine, but she sees what she believes to be a mountain lion outside, and calls animal control. The officer who shows up, Graham, proceeds to call her (not precisely, but you get the drift), a liar, a drunk, and a woman who made up the story to get a Friday night date. Not a great first impression for either of them. But the next day, when certain facts come to light, he proceeds to apologize to her even though she's having none of it. That's when things start to happen. It seems a number of exotic animals were set loose in the area, and now the town is on the lookout to catch them. 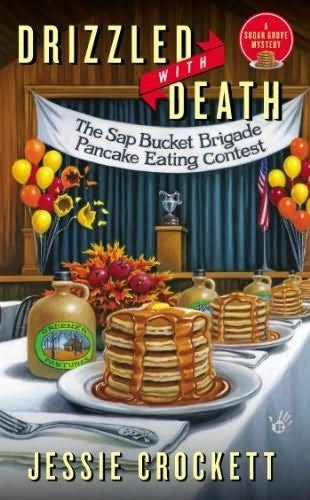 When Alanza drops dead in her food, Dani's ex-boyfriend Mitch practically accuses her (or one of her relatives) of committing murder to make sure her grandpa wins the pancake eating contest. Really? I didn't know pancakes trophies were that prestigious in New Hampshire. I mean, I would have at least thought the guy could have come up with a better motive. He's not a very bright officer, in my opinion. He's also quite nasty. He lies about her to Graham, and we never do find out why he and Dani broke up. Also, everyone in her family has names like Celadon, Loden and her grandfather's, Emerald. She hints that Dani is only a nickname for her "terrible" real name, but doesn't tell us what it is. Is this the author's way of insuring we buy the next book in the series? It doesn't work with me. And I understand that her family makes maple syrup, but how much can you eat without becoming diabetic? I get that it's their business, but did they ever think of eating anything else? Everything - or nearly everything - has maple in it. You'd think at 27 she'd be tired of the stuff; but no, she keeps eating it. All I know is if I ate the same food, day in and day out, I'd be sick of it before I was her age. But the people in this town love it, and the restaurant even has maple heart-attack recipes. (My husband's family has walnut trees in their yard, and he ate so many walnut recipes growing up that he refuses to eat them now, so I know it happens). Dani herself isn't very likeable. She tells us she's small, under 5 feet, and shops in the childrens' department at stores. She also makes a rather snide and shallow remark about her brother eventually going bald. Plus, she's immature. When her mother begins dating again, she has problems with it because her father has only been gone "five years." How long does she expect her mother to wait? She avoids her family rather than discuss things with them, (which, I've found in my own experience not healthy at all), and personally, I felt that the reason she refuses to get married is just to spite her family, because they are always trying to find someone for her. Unfortunately, I felt this book was a struggle to read, and I had to force myself to do so. Maybe if Dani were actually not so sullen or judgmental - but someone else might actually enjoy the book with the information on the sugaring operation in New Hampshire. Unfortunately, it wasn't enough to keep me interested. Amanda Hazard, a CPA who is very pregnant, just wants to decorate her office for Halloween, try and win the best decorating contest. Nettie Jarvis owns a pumpkin patch, and has promised Amanda all the pumpkins she wants. So, when Amanda arrives at Nettie's she finds more than what she came for. 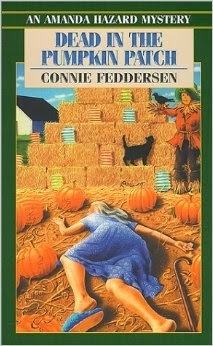 She finds Nettie's body nestled in between the pumpkins. Amanda's husband, Chief of Police Nick Thorn, is sure Nettie died from natural causes, but not Amanda. He tells her to leave it alone, worried because of her pregnancy. But Amanda had received an ominous telephone call from Nettie the day she died, and she knows that Nettie was murdered. She also knows that she needs to find the killer before the killer finds her. Amanda is an unusual character in the fact that she's a CPA, which is what drew me to this mystery. Usually the amateur sleuths own a retail store of some sort (books, bakery, restaurant, etc. ), and I thought this would be different. Which it was, in a few ways. 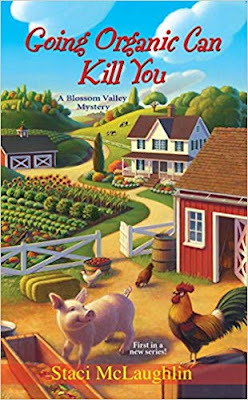 First off, she finds Nettie's body and decides she was murdered because Nettie was wearing house slippers instead of tennis (and I'm not giving anything away, because you find that out almost immediately). Of course, her husband thinks she's just over-reacting because of her physical state, but tells her he will investigate anyway. And of course, Amanda, who is looking for a little black book that Nettie had told her she wanted to give her for safekeeping, decides to go ahead and investigate on her own. Amanda is made executor of Nettie's estate, which I found different because I've never heard of a CPA being made executor. Relatives, attorneys, yes, but CPAs, no. Not to say it doesn't happen. I've just never known it to be, although somewhere it's possible. At any rate, she finds the book but doesn't turn it over to Nick, because she wants to see if there's anything in it that help with her investigation. Which again, of course, there is. It turns out the book is a font of information on the residents of town. 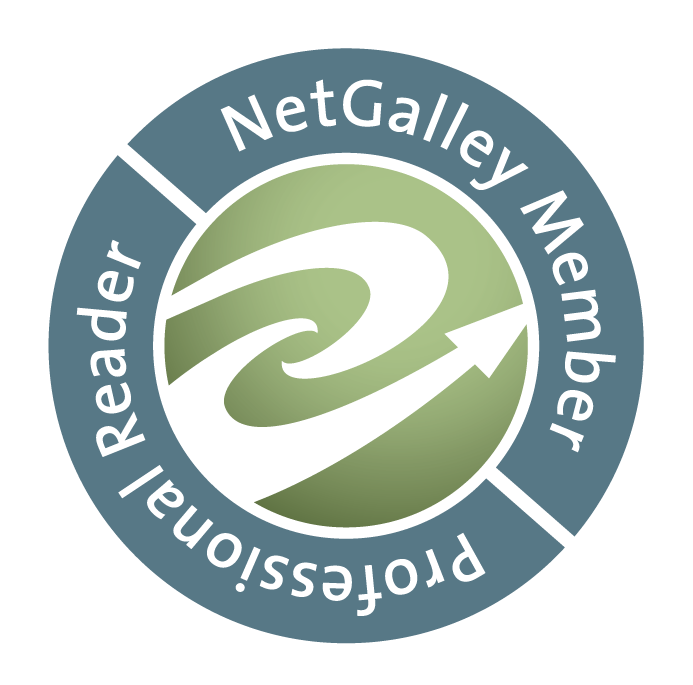 And that Nettie, a former hairdresser, knows almost everything about. In the wrong hands, the book could be disastrous. Yet Amanda knows that somewhere within lies clues to Nettie's murder. Yet there are plenty of red herrings in this book - a lot of information pointing to a lot of different people as the murderer, and you have to sift through everything to find the answer. Which she does eventually. The reason being is that Amanda's hair was unfortunately dyed a bright orange, and Velma (who is the town's hairdresser) decides that with her hair and expanded belly, she would be perfect for the local Pumpkin Queen. Which means she has to wear a costume which is a bright orange pumpkin...and lights up. So Amanda spends quite a bit of time investigating in her costume. However, there were a couple of things that bothered me. Amanda, her husband, and their best friend (Sam Harjo) all call each other by their last names (Hazard, Thorn, Harjo). I found that odd. I've never known anyone of my acquaintance to walk around using the last name of their spouse (and since this takes place in Oklahoma, I'm pretty sure it's not a Southern thing, since my Daddy was from Texas, and no one in his family has ever done it). So the entire book, he refers to her as "Hazard" or "Haz" while she calls him "Thorn." Very odd. But the big thing that bothered me was the 'robot talk.' Anyone who knows me knows I don't like this in a book. Nobody talks robot talk. By that I mean a character will say things like this: "I am going to the store. I am going to buy milk and then I will go to the gas station. After that I will stop at the post office and get the mail." What people will say is the following: "I'm going to the store to get milk and then stopping for gas. On the way home I'll pick up the mail at the post office." This went on through the entire book. It went back and forth between using conjunctions like normal people and then you'd have entire paragraphs of robot talk. The point is, people write this way, but they don't talk this way. I really dislike it when I read a book and all the talk is robot talk. However, that notwithstanding, I still gave it four stars because I like the characters, I liked the plot, and I liked the mystery. And that's really what counts in the long run. Well, I know it's been awhile since my last post - but unfortunately, it couldn't be helped. I had a negative reaction to a fairly new medication I was taking, and went into anaphylactic shock. Not a pleasant thing to happen, and with minor complications, it's been a slow recovery and I honestly haven't wanted to do anything at all except get well again. I'm grateful I've gotten through the past few weeks and am beginning to feel like a human again. So, in no time at all, I should be able to be back up to speed. Thanks for bearing with me!